Popup Blocker Lite is an Opera addon to block all annoying popups and pop-unders. When the addon detects a popup, it will block it immediately and the badge icon will show the blocked item (number will increase). If you want to see notifications about the blocked popup, please enable desktop notifications from the options page. a. 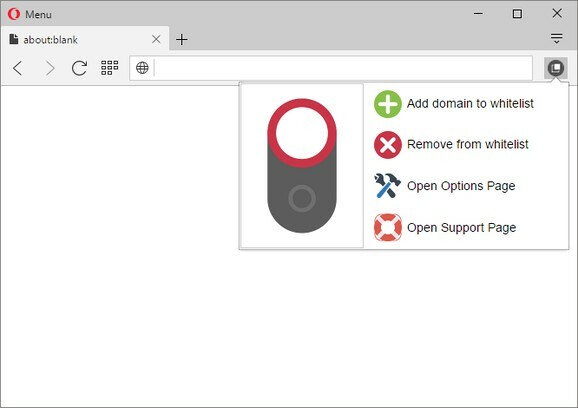 Allows you to block all unwanted popups and pop-unders. b. 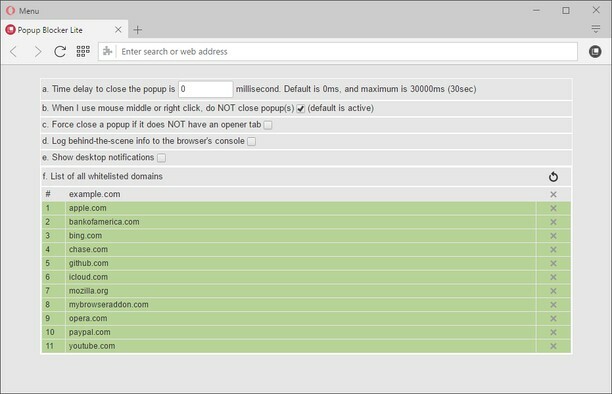 Has a built-in feature to whitelist a desired domain in order to show popups. c. Works fundamentally different than other popup blockers, therefore it works in almost all cases. d. Has a switch to turn the addon ON or OFF from toolbar popup UI. e. Several settings in the options page to adjust the addon's functionality to your need. f. Has badge icon text to show you the number of blocked popups. g. Very lite addon with no significant CPU and memory usage. Note 1: when you first install the addon, some websites are added to the whitelist table by default (open options page to see or edit the list). 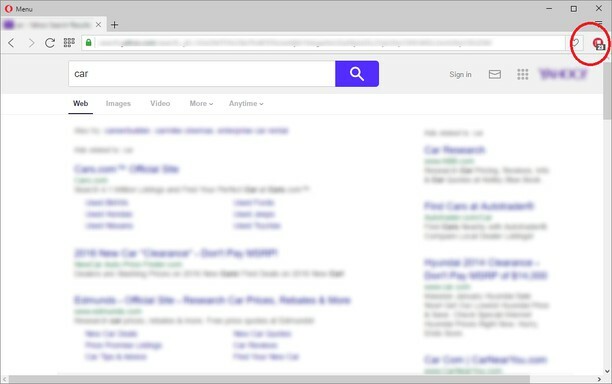 When a domain is whitelisted, the addon's toolbar button icon is green. When the addon is disabled or a website URL is invalid (i.e. chrome://) the icon is dark gray. All other cases the toolbar icon is red. So, while browsing with this addon, please be aware of the icon color to make sure it is set based on your desire.